Shotkit features the photography of hundreds of the world's best photographers and an exclusive peek at what they carry in their camera bags. Everyday thousands of photography enthusiasts from around the world visit Shotkit. If you would like to be a part of Shotkit, why not submit your kit? Remember, we're just as likely to accept a submission from an 18 year old amateur as we are a seasoned pro - it all depends on the quality of your submission and work. So submit your kit today and good luck! Gain exposure to hundreds of thousands of world-class photographers as well as potential clients from around the world! Promote your site, work and whatever message about photography you feel is important. 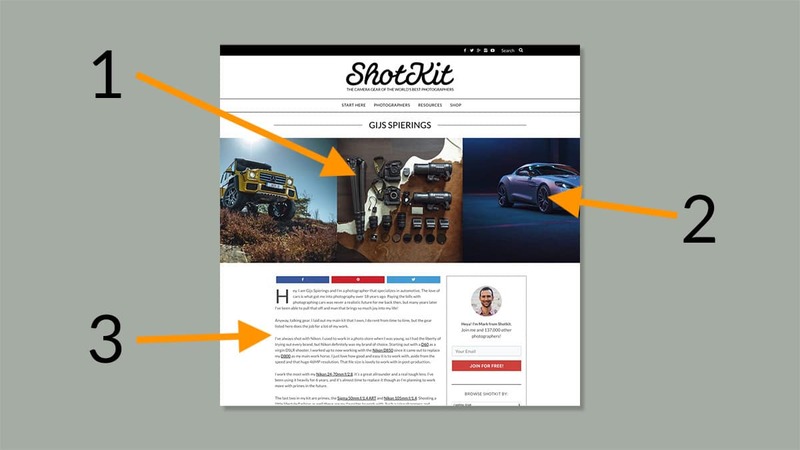 Grow your social media following - Shotkit will promote your page regularly to its fans. Help out the community by giving them an exclusive look into a master's tools of their trade! Join a community of likeminded professional photographers and share the joys of photography and learn together! How much does it cost to be featured on Shotkit? Due to the large number of submissions I receive each day, successful Shotkit submissions are subject to a $40 processing fee. You will only be charged if you submission is successful. If you have been personally invited to submit by Mark, there is no fee. Every week Shotkit receives hundreds of submissions from around the world. Only a handful make it onto the site. How do you make sure your submission has the greatest chance of being accepted? 1. Follow the guidelines above to the T! Read them carefully. All the information is there. 2. Make sure all your photos are for one genre only. Decide what genre is your strongest and stick with just that. 3. Spend time on your write up and Shotkit photo (see examples here). Even if you are not accepted but your Shotkit photo is great, you may be shared on the Shotkit social media and your website credited. A photo of the contents of your bag, neatly laid out. Taken from above in daylight would be best. Original location would also stand out. Take your time to get this right as it will heavily influence your submission being accepted. A selection of 5-10 of your best photos from one genre which will be featured on Shotkit. Photos must be JPGs and filenamed 'FirstName_LastName_Shotkit'; high quality jpg; resized to 580px tall. A write up about you, your photography, your gear (be specific about brands/models) and how you use it/why you chose it, and anything else you may find relevant.